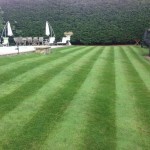 Cranleigh is in the heart of the Surrey hills, Surrey Total Lawn Care Ltd currently provide lawn care to Cranleigh and all of the surrounding villages and every where in-between. Villages include, Abinger, Wotton, Forest green, Peaslake, Ewhurst, Wallis wood, Ellens green, Rudgewick, Dunsfold, Bramley, Wonersh, Shalford, Chilworth, Alfold, Shere and many more. Having grown up in this part of Surrey, we have a fantastic knowledge of the local area, its soil types and how the weather in our region effect the lawns. If you are lucky enough to live in Cranleigh, then chances are that you are aware of the Cranleigh clay that runs through the best part of the village. For this reason, moss is a large problem for many home owners in the village. We know this and are happy to help advise you on any steps you can take that will help you beat the moss back. So why not give us a call so we can pop in and see if we can help. Surrey Total Lawn Care Ltd also cuts grass, feel free to ask us for a weekly, fortnightly or perhaps you need a one off, or holiday grass cut. We are happy to help out if we can, so don’t be afraid to ask.